I made the news today – and while an actual review would have been nice, I will take free advertising without complaint! This article appeared on the front page of the Today section in The London Free Press, and I am grateful to them! Nice to be featured with these other excellent artists as well. I have decided to post my own watermarked photo of the featured painting they chose for the article – it will give you a better idea of the colour. 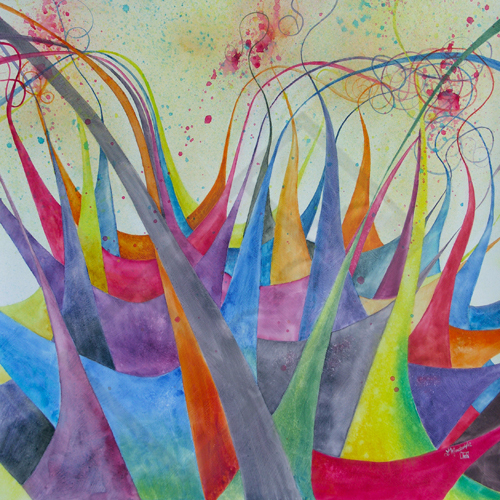 This is one of the five watercolours on gesso that are in the exhibit, and it’s called Colourfest. Like the others, it began as a digitally generated fractal, and developed from there. Another item of publicity is this video made by The ARTS Project. It was the end of the day we hung the show, so I hope I am not rambling too much in it. You can see Colourfest hanging behind me! This entry was posted in Art, Fractals, News and tagged art, exhibit, fractal art, fractal geometry, fractals, gesso, Lianne Todd, local, London, newspaper, Paintings, The ARTS Project, The Fractal Nature of Our Universe, Watercolors, Watercolours by Lianne Todd (artist). Bookmark the permalink. Thank you very much 🙂 You have some wonderful ideas in your blog which is why I’m following! If you live near London maybe you would like to come out to my studio some time, I’m not too far away. SadlyI am nowhere near 😦 I live in Canada but have visited London and love it. Ah. Hang on, you know this is London, Ontario right? I realize you still must live far away but just wanted to make sure we’re on the same page.